Roland Garros welcomed us with thunder and rain but the weather cleared up quickly and the men's semi finals were on, just 60 minutes delayed. The match between Swiss Roger Federer and Spanish Raphael Nadal was touted as the "battle of the giants" and it really was. A truly spectacular game with the French audience adding extra spice by cheering on the players both in well and awkwardly chosen moments. Nadal won 6-3, 4-6, 6-4, 6-3 which took him to the finals against the Argentine Puerta. A nice touch was the fact that it was Raphael's 19th birthday. He could not have wished for a better birthday present. 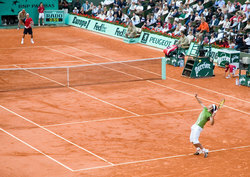 Nadal went on to win the French Open last Sunday by beating Puerta 6-7, 6-3, 6-1, 7-5. This entry was posted at 09:53 PM.